Just how are those Windows 8/Windows Phone 8 launches going? The good news, Microsoft is delivering on its promise to blanket the media with Windows 8/Surface/Windows Phone 8 messages. But when I put my feet on the ground and took a look at local retail outlets what did I see? For PCs in general things were looking pretty good. The local Microsoft Store is crowded with people checking out both the Surface and all PC form factors. Best Buy was crowded with people checking out new PCs running Windows 8. The Dell Showcase made for a very prominent Windows 8 display. Staples was empty overall, but had a nice display of Windows 8 PCs. MicroCenter was crowded, also with people checking out new PCs, although unlike Best Buy it was a mix of Windows 7 and Windows 8 devices. And maybe the best news, I heard sales reps competently discussing Windows 8 and in one case addressing the Start Screen/Menu controversy. So that was the good news, but the bad news is far more important from a strategic standpoint. There are just about no Windows Tablets or Convertibles in retail stores. The same goes for Windows Phone 8 devices. Let me get the later out-of-the-way and then I’ll go into the former in more detail. I was in Denver’s Cherry Creek Mall yesterday and stopped in the AT&T Store to see the new Windows Phone 8 devices. All they had were mockups, no live devices. They suggested I try the Microsoft Kiosk (one of the holiday stores that Microsoft opened this year). Well, Microsoft didn’t have any Windows Phone 8 devices either. One of the sales reps told me that if there were any around he would buy one with his own money just so they had one to show people. Ok, I think this situation is a big enough “insert appropriate vulgar phrase here” by Microsoft, AT&T, Nokia, HTC, etc. to warrant some kind of award. Now back to Windows 8. Windows 8 devices are featured prominently, often exclusively, at all retain outlets I visited. The Microsoft Store features the Surface as well as ASUS VivoTab RT, and the Kiosk is the dedicated to showcasing the Surface. But other retail outlets do not have tablets and they do not have convertibles, they just have traditional PC form factors. Most of those feature touch, making for great Windows 8 experiences. But where are the tablets? I started my tablet-quest at Best Buy. No Windows tablets in the PC area. One convertible, a Lenovo IdeaPad Yoga 13, buried in the back away from the main display area. I go over to their tablet display, filled with Android devices and a separate little table for the iPad, and find no Windows tablets. I ask a sales rep if they have any Windows Tablets and he takes me over to the mobile phone area where a lone ASUS VivoTab RT sits lost amongst some Android mobile phones. No signage attests to its existence. I’ll give Best Buy a D-. At least they had a tablet and a convertible, though they were making no attempt to feature them. Things weren’t so good at a local Best Buy Mobile store. They had no Windows Tablets of any kind, and the sales reps weren’t happy about it. F.
That Dell Showcase? No tablets or convertibles. The sales rep is in love with the XPS 12, but they haven’t sent him one to display yet. They claim they are too busy meeting consumer demand to send out display models, which sounds good but you can tell the rep is tired of telling people that. They’ve given him dates for the display unit a couple of times, but it still hasn’t shown up. F.
MicroCenter? No convertibles. After walking around the store twice I’m convinced there are no Windows tablets either. Then I’m walking by a table displaying Android tablets and I see one of them lit up with the Windows 8 lock screen. No signage lets you know that it is a Windows 8 tablet. In fact, you can’t even tell what model it is unless you know that a TF600T is an ASUS VivoTab RT. No I did not know, I looked it up. F.
While Windows 8 may be doing just fine with the traditional PC buyer, the critical task for Microsoft is to capture a healthy share of the market that would otherwise move to the iPad or Android tablet. And they can’t do that if no tablets or convertibles are in the retail channel. So I’m rather concerned by what I’m seeing in my tour of retail outlets. If I just focus on tablets and convertibles the best grade I could give Microsoft is a D. That grade goes up considerably if I consider how well traditional form factors with the addition of touch screens are doing. But those are not what is going to change the market dynamics. Microsoft and its partners have to get their range of tablets and convertibles into the broad retail channel. NOW. This entry was posted in Computer and Internet, Microsoft, Windows and tagged Best Buy, MicroCenter, Surface, Windows 8, Windows 8 Tablets, Windows Phone 8, WIndows RT, Windows Tablets. Bookmark the permalink. 21 Responses to Just how are those Windows 8/Windows Phone 8 launches going? I wonder if the lack of Win8 tablets could be some form of “payback” from the hardware makers to Microsoft for attempting to upstage them with Surface? Or is it that the hardware makers only see a future in intel based tablets? I’m a Windows .NET developer so I tend to approach things from a software perspective. It seems to me that MS is perhaps carrying over the mistakes from two years ago (i.e. WPF is dead, Silverlight is dying, HTML5 is the future). If they haven’t done much to address that in 2 years why would we expect a better message on the hardware front? I had a similar experience, though my “tour” of local stores (in Arlington, TX, where I wanted to compare tablets) was a week after launch. They didn’t even have many Windows 8 laptops yet (and they weren’t marked as such, as you noticed). I guess this demonstrates why Apple, back when they were far less valuable a company, decided to build their own stores. Inertia is a hard thing to fight….though you’d think that Microsoft’s OEM partners would be doing more to fight their corner. I also saw not a single Win8 / WinRT tablet. I remember standing at the “tablets” table, and a salesperson was chatting up an Android tablet to some parents who wanted to buy a portable device for their college-bound son. All the things they wanted screamed Win8 tablet. There’s no excuse, though, for Microsoft Stores not to have phones. What the point of a Microsoft store if it doesn’t showcase the latest Microsoft products? As far as WP8 goes, both AT&T stores I went to had the actual devices available, and as I said in my post in another topic, the largest display in the store featured Windows Phone 8 and the Lumia 920. The choice of colors seems to be variable. A few of the AT&T stores had black, white, and red Lumia 920s available, but most only had black. The AT&T reseller I wanted to buy my phone from didn’t even have a single WP8 phone as of late Saturday afternoon and weren’t sure when they would get them. As far as tablets go, I’m doing my best to avoid all malls from 11/1 through 1/2 and the Microsoft pop-up store here is in one of the busiest malls with the worst traffic getting in and out, so I can’t report on that. I think the situation is hopeless. Classical principal-agent problem. Best Buy is now making a loss, but back when Best Buy it was making a profit, it came primarily from extended warranties and other ancillary services — not from sales. They really don’t care to push your product, no matter how revolutionary you think it is. If it delights the customer, it might improve brand loyalty for your product, but it doesn’t help Best Buy. They just want to sell you *something* — *anything* — and then sell an extended warranty on it. Last time I was in Staples, the clerk at the checkout counter tried me to sell me an extended warranty on a paper shredder. A paper shredder! This is way into “If it breaks, throw it away and buy a new one” territory. It just goes to show how lucrative the extended warranties are, and how the salespeople are commissioned to push them. What’s next? An extended warranty on a stapler, in case the spring breaks? This is precisely why Apple set up its retail stores. They knew that the situation was hopeless and irreparable, so they opted out. With their own stores, they could control the experience, and make sure the focus is on Apple’s products. They can show the customer how an Apple product will make your life better — whereas electronics retailers would be happy to sell you any old product and convince you how the warranty will make your life better. Microsoft needs 2,000 retail stores in the US — and it needs them *yesterday*. Funny MicroCenter story. I picked up a USB memory stick for $7. The cashier tried to sell me an extended warranty for it. I don’t know that even Staples or Best Buy would have sunk that low. That is funny, but I have to wonder about the quality of a $7 USB memory stick. Was this for a one-off transfer between two devices? I don’t ever use them for long term storage. Usually things like needing a bootable security scanner to make sure a system doesn’t have a rootkit on it. So I do treat them as semi-disposable. Best Buy, Staples etc only make money from extended warranties and ancillary services. The margin on consumer electronics is paper thin as they need to compete against Amazon. Apple are just as bad at pushing extended warranties though. When I bought a MacBook from the online store and declining AppleCare, they called me a week later to try and sell it to me. This was followed up by an e-mail. They then called me a month before the regular warranty expired, also followed up by an e-mail. As (at the time) AppleCare was approximately a quarter of the cost of the MacBook, I declined every time, even after listening to the sales pitch. I would love to know what the attach rate of AppleCare is to every new Mac, iPad or iPhone. I bet it’s pretty high. I don’t know, but after my wife’s iPhone 5 screen cracked the day after she got it she paid for a repair and AppleCare. Apple took in more on those than on the original phone. My local Best Buy had the Yoga 13 prominently displayed along with at least one RT tablet. Also, my local AT&T store had the real working Windows Nokia and HTC phone devices right next to the iPhone and ahead of the Droids. They are probably clearing out the Windows 7 inventory ( hardware ). That explains the ridiculously low upgrade price for windows 8 on new win7 preloaded hardware. Next quarter is probably when you will see the new devices. The stores are filled with brand new Windows 8 optimized systems, just not tablets and convertibles. But you want one of the new touchscreen Ultrabooks? You’ve got a lot of choices. You want one of the latest generation of all-in-one’s? No problem. You want a desktop replacement laptop that has a touchscreen? They have them. Perhaps retailers just have not yet been shipped any stock yet? Australia is even worse. All the stores have the Windows 7 and Windows 8 Laptops and All-in-ones all mixed together. I have not found one touch screen laptop in stores. I have found the Asus VivoTab RT once. And the horrible Sony slide convertible. Microsoft has banner ads up on Freeways and Bus stops, but when people get to the stores they are just finding the same old laptops. I can’t find someone to give my money to. Very disappointing. There’s no question why Microsoft made the Surface. Their partners are letting them down badly. I want the Asus Transformer Book, but where is it! And where are the multitudes of $500 10″ or $200 7″ tablets running Windows 8? I want a 7″ for each of my boys due to the built-in Family Safety controls. Here in the northern Dallas suburbs it’s a little different. I went into an AT&T store last weekend. They had a Lumia 920 prominently on display, but were sold out (they’d sold out Friday, got some more stock on Saturday and sold out again). The Windows phone area of the store also had spaces for the 820 and two HTC models, but the holders were marked “coming soon”. A T-Mobile store nearby had display and stock for the Lumia 810 (I think that’s the model number) and the HTC 8X yesterday. In both stores, sales folks seemed genuinely excited about WP8. It seems silly that the only Microsoft Store in the Dallas area is a pop-up in an extreme nothern suburb. I went there the weekend after the Surface launch and it was *extremely* busy. They’d had 4-hour lineups the first day and sold out. They restocked on the Saturday and sold out again. I stood in line for quite a while for a chance to look at a Surface. I didn’t see what else they sold (I’d had enough of standing in line). There were probably more folks clustered around the tiny Microsoft pop-up store than there were in the Apple store 100 yards away. What I find odd is the lack of emphasis on touch in retail marketing. If I were shopping for a Win8 system, touch would be very high on my list of required features. Even a desktop system with a big monitor will work better with touch (not to use as a mouse replacement, but to use occasionally – I know that I use touch all the time on the laptop that I’ve been running Win8 and it’s previews on). Advertising doesn’t emphasize systems with touch at all (I saw an ad yesterday for a laptop that I knew supported touch that didn’t even mention the feature). I’ve yet to see an ad for a touch-based monitor. You’d think the monitor makers would be seizing on a chance to see me a new monitor that can fully take advantage of the UI formerly known as Metro. Monitors are even more commoditized than PCs. Companies in low-margin industries tend to excel at supply-chain management, not at market development. About an hour north in Fort Collins, not only did the AT&T store have Nokia 920 and HTC 8X devices, the staff were all wearing blue Windows Phone 8 t-shirts. It was pretty cool. They had black, white and red 920’s. My wife got a red 920. They also had the HTC 8X in what I guess is purple? There were a fair number of folks checking out the Windows Phones while we were there. 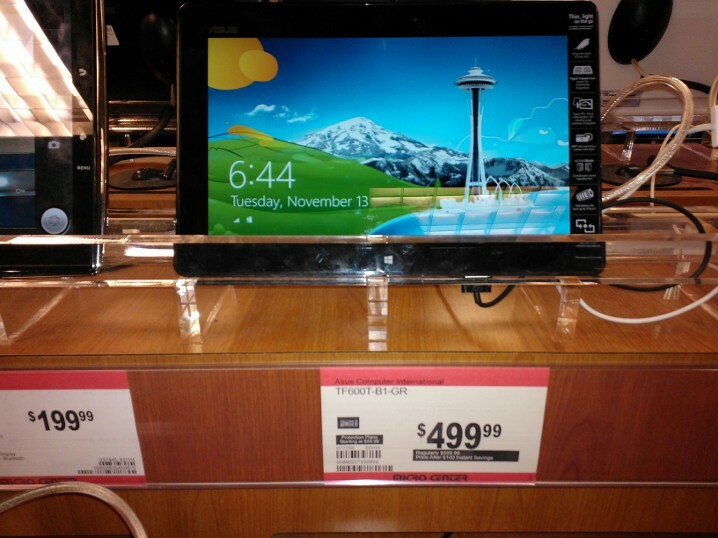 And the local Best Buy has the Lenovo Yoga and Asus Vivo tablet display at the front center of the store. After playing with laptops like the Yoga, I’ve decided my next laptop must have a touchscreen. My experience trying to get my hands on the HTC 8X Windows Phone: First, pre-ordered from Verizon on 11/8 with orders supposed to ship on 11/13. Verizon emailed on 11/14 to say that the pre-order did not ship and did not offer any new ship date. But wait, later on 11/14 Verizon emails to say that the HTC 8X will be avilable in stores on 11/15. Perfect. Pre-order canceled. Visit two Verizon stores on 11/15 and neither have the 8X available or even on display. “We have to order it” they say. The amount of promotion is clearly not lining up with retail on an operational level. I don’t spend a lot of time at the mall. If I drive/rail to the store, and I can’t touch a real product, it doesn’t matter if one is in stock. I couldn’t tell if the device looked good enough, and seemed “right” enough that I’d put my name on a waiting list, or order from the company on-line store. Even if they could’ve put a sealed box into my hands, the store failed in its basic raison d’être. This is just a statement that Microsoft is clueless about retail.